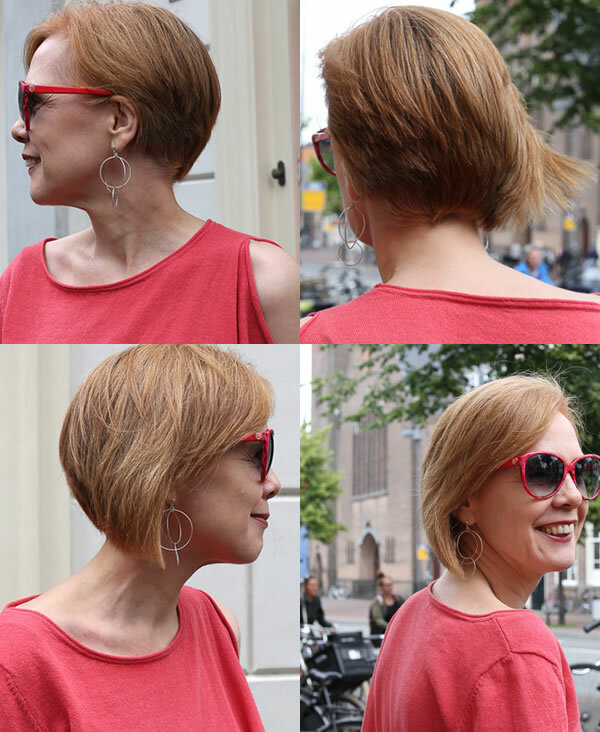 It’s summer, which means a great time for a change in hairstyle! I went a bit more radical this time as I really wanted an asymmetrical cut. Although I like the change I’m not 100% happy with the cut yet and will probably have the longer side cut a bit shorter so it’s only shorter in the front. We’ll see what my new stylist will say! I’m in The Netherlands now so will have to try my luck with a brand new hairstylist. I also plan to add some highlight for summer. This was one of the most colorful tops of my summer capsule that I packed for summer. It’s perfect for high waisted pants as it will highlight your waist despite the wider fitted model of this top. It works really well as a layering piece too. For more tips on wearing these (more challenging) pants, check my tips on how to style wide cropped pants. The Netherlands is usually where I purchase new shoes as they’re all on sale and available in my size. I’m loving these new brogues from the (new to me) brand Gabor which will be very comfortable for walking. I noticed they have lots of other fabulous shoes too. I have also been adding more colorful pieces to my summer capsule so this top is no longer the only colorful item. I will show you more of that in later articles. 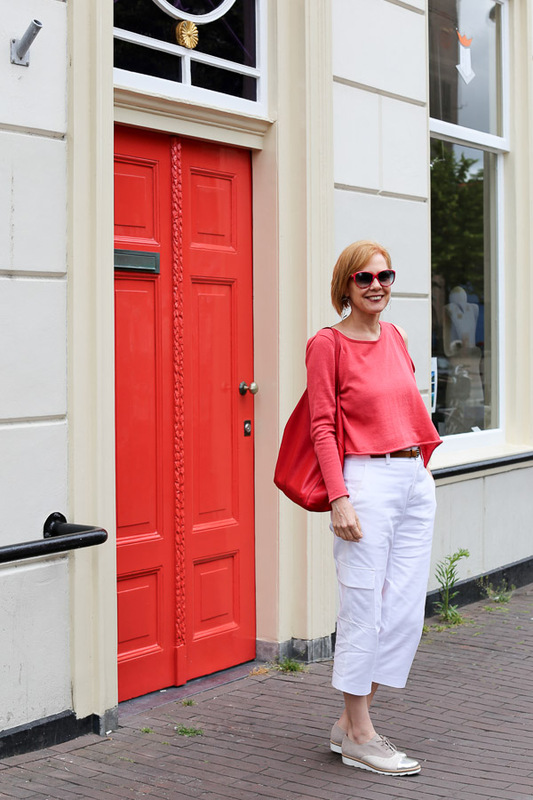 Color is very much on my mind at the moment as it’s the style training theme this month in the 40+Style Club! image consultant and color professional Ruth Essex dives deep into all aspects of color in this month’s style training with lots of great information on how to find your best neutral, your best metallic, how to make neutrals interesting and how to combine colors. If you like to take advantage of this training as well as the additional capsule wardrobe you will receive and the opportunity to be part of one of the most stylish and supportive communities, you can now join the style club now and get instant access. Here is a chat I had earlier (before my haircut) with Ruth on how to wear color. Are you embracing color this summer? P.S. Don’t forget to take advantage of all our training on color this month and join the style club! You look adorable! I love the haircut and the colorful top. I had a similar haircut several years ago, and found myself constantly tucking the longer piece behind my ear (not a good look, it totally destroyed the lines of the cut). I then saw a photo of my hair (un-tucked!) and thought I looked quite chic — hopefully, you like what you see, too! Yes I tend to do the same…. Definitely will need to make some changes! Love your new hairstyle! I agree highlights would add a lovely touch. I just ordered my first ever pair of presciption sunglasses – similar to yours but in blue. Can’t wait for them to come in! I get so many compliments since I started dressing “intentionally” with accessories, putting thought into my outfits. That’s so wonderful to hear that you get so many compliments. Great to hear that you like the new hairstyle. It’s an acquired taste for sure! Love the style and color of the top. Almost love the hair! Gabor is an amazingly comfortable shoe. I have several pairs of shoes and boots. Discovered them in Paris several years ago where they have a very large shop. Haha I love how you say that you almost love the hair. Perhaps with the change you will like it too 🙂 This hairstyle is definitely not for everyone. Yes, my Gabor shoes have been a success sofar. Great cut and colour! I had my hair like that when I lived in Tokyo, when my hair was white, but both the short side and long side were a bit shorter. You have all kinds of styling possibilities with this cut too. Glad to see you still rockin’ the A-game with asymmetry – love your top. Oh didn’t see you in this top. Looks ever so good on you. And yes those brogues with the cropped trousers… very good. Gabor as a brand has been around for ages and are very well know for their comfort. Great photos. Who took them? Love, love, love the outfit! I want the entire thing!! The hair is a big hit as well! My only constructive criticism would be is that I would love to see you be more aware of your posture. Not only can what we adorn our bodies with age us, but so can the way we physically carry ourselves. By gently lifting your sternum up, you automatically drop your shoulders back, elongate your torso and allow yourself to breathe better! All of which makes us look and feel more energized and youthful! I just got through reading your past post about posture! So many people struggle with poor posture! Have you consider hiring a personal trainer for a bit to help you with this issue? The solution does not have to be such a struggle. While you strengthen your core and back, you also stretch and open your chest. I also suggest a focus on embodying! Getting back into our bodies and really feeling the sensations can be so gratifying! I have a client that I’m working with and her comment to how are you feeling is “open”. What a wonderful word to describe the sensation of being more lifted, being able to breath better and feeling strength in the core! I wish you progress and success on your posture journey. Let me know if there is anything I can do to help! I have also had an asymmetrical cut for a few years. I wanted to do it MANY years ago, but was afraid of being non-conformist. Now, strangers come up to tell me how much they love my hair! Why did I wait so long?! I tweaked the lengths a few times, as well as where the part goes. This was easier to decide after looking at pictures rather than in the mirror. I started with one side quite short (above my ear), but have modified it to mid ear, so that my earring is not obscured. (I only wear one). The longer side ends about at the same level as my lips, but in the winter, I may let it go to my chin. I feel like a little asymmetry is more flattering on me than a big difference. 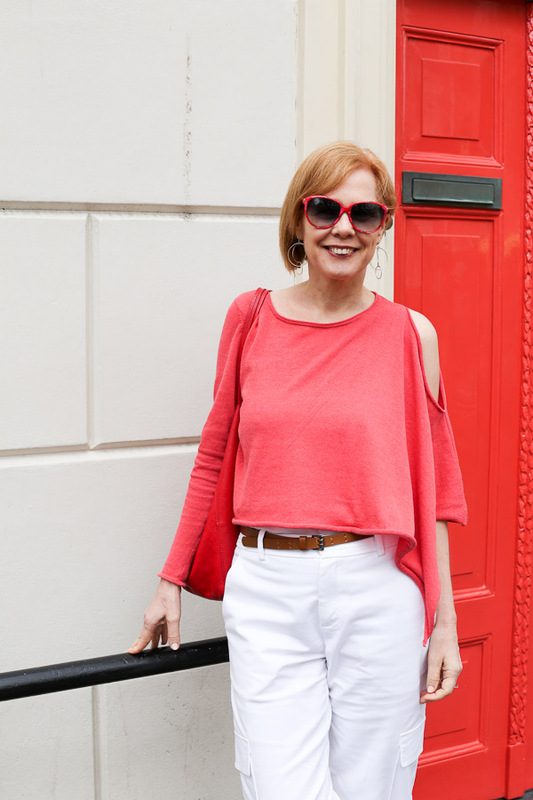 I believe that this style is flattering on me because I am asymmetrical everywhere–one eye noticeably higher, one breast 1/3 smaller (from surgery), one hip higher and more forward, etc. So, repetition! Well done for taking that step and great to hear that it’s been a success! Next post: Choosing the best travel shoes and combining with color!